I have received my new Stampin Up order and in it is the bird builder and the Mosaic Madness stamp set and punch (currently bundled to save pennies). I have had my eye on Mosaic Madness for some time, but have only just got around to ordering it. I think that is called faffing! The stamp set is great value for money. You get 6 lovely mosaics, 3 smaller decorative tiles and two long and I must say beautiful strips. 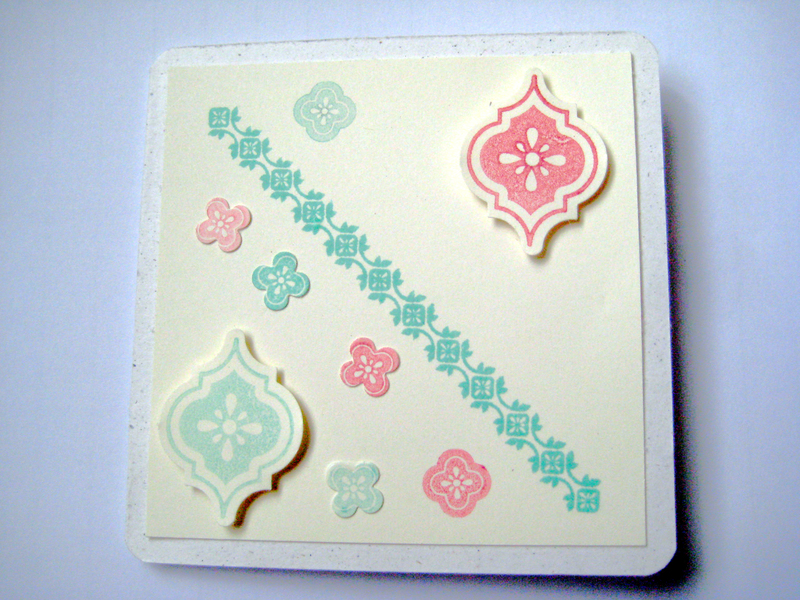 The card is a neat 3.5″ square made with Naturals White cardstock, on to which I have put a square of Very Vanilla card just a touch smaller. The inks used are Costal Cabana and Primrose Petals and the tiny little flowers are punched using the tiny flower punch from the “Itty Bitty” punch set. Let me know what you think and don’t forget, if you want to order the stamp and punch, click on the “shop now” link on the left.